This Just In … he came in 7th out of 35 swimmers with a time of 2:13:47. The rescue boat didn’t hit him once. 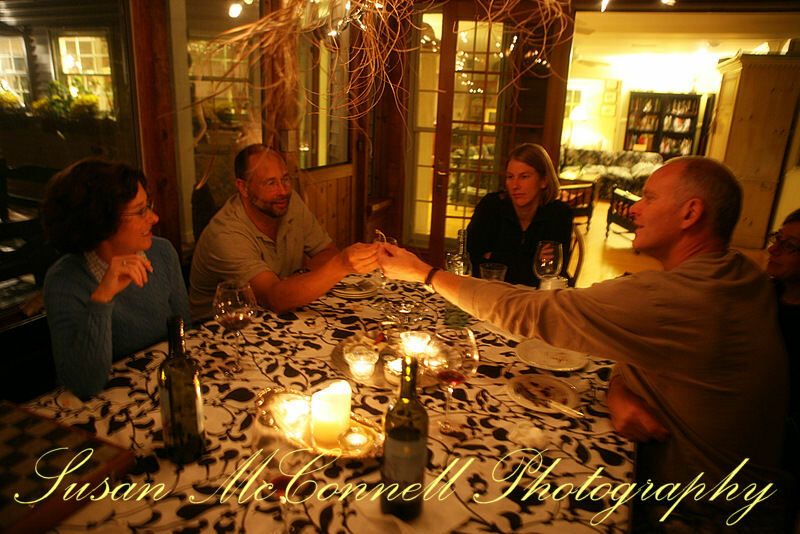 Note: Open water swimming races lead to a lot of really nice, small dinner parties. In this photograph, Doug and his long time swimming buddy, Dave “bish” Bishop, make a special wish on a turkey wishbone. Flash forward six months and this morning Douglas is swimming a 5 mile open water race in Minneapolis that begins at Excelsior Beach and ends at Wayzata beach. Our sons, Bill (18) and Gordy (16), are driving his guide boat. Last year he came home quite bruised up from that friendly guideboat as the wind was blowing 20 knots. This morning the wind is blowing 6 knots so I’m feeling more comfortable about the bruising part of the story. Two weeks ago he swam in a 10K in Indiana and came in 5th of 15 in his age group. (50-54 years) Overall he came in 44th out of 150 swimmers. This was a national race and the qualifying was important.